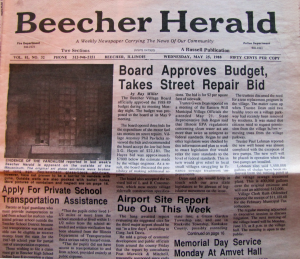 reported in last week’s Beecher Herald is apparent on the outside of the Mausoleum. 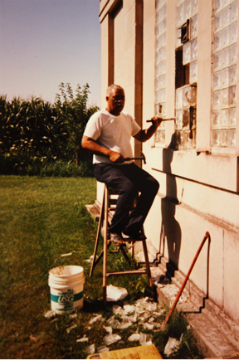 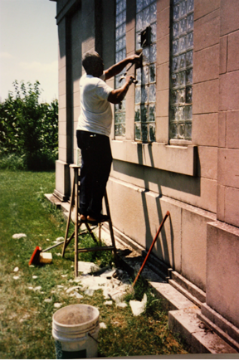 The original art glass windows were broken out long ago. 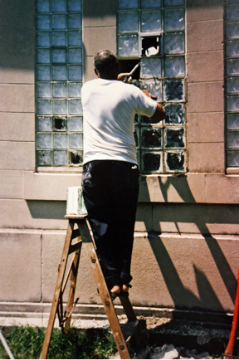 Replacement glass-block windows, however, have not proven to be a barrier to vandals with guns. 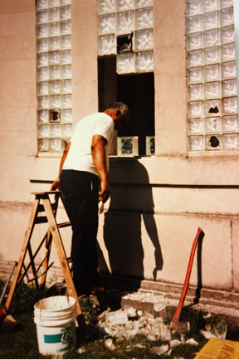 Outside walls are also pocked with bullet holes. 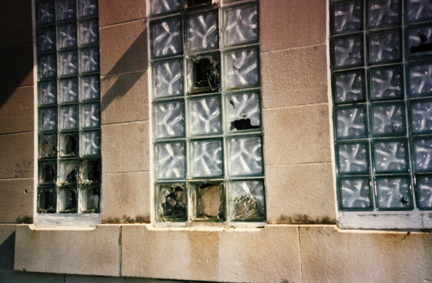 More pictures of vandalism and neglect are on page 16. 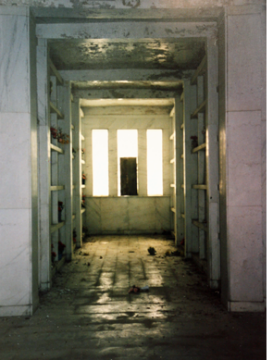 YEARS OF NEGLECT are revealed in the peeling ceiling of the Beecher Mausoleum. 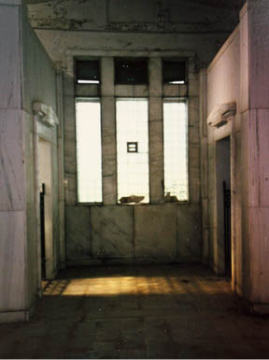 The one beautiful marble floors and walls are now water stained. 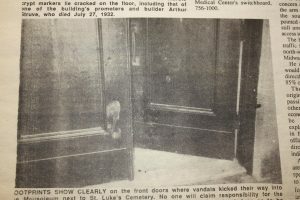 Some marble crypts markers lie cracked on the floor, including that of one of the building’s promoters and builder Arthur Struve, who died July 27, 1932. 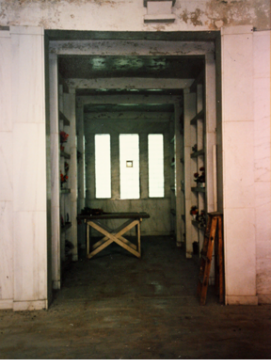 FOOTPRINTS SHOW CLEARLY (photo) on the front doors where vandals kicked their way into the Mausoleum next to St. Luke’s Cemetery. 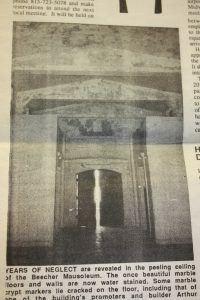 No one will claim responsibility for the upkeep and maintenance of the building one described as “constructed so as to be ___ear everlasting as can be conceived at this age.” Little did the 1914 builders know ____ latter century vandals, beer parties and non-existent caretakers. 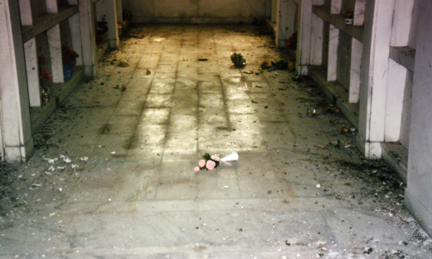 Below are photo’s taken in 1996. 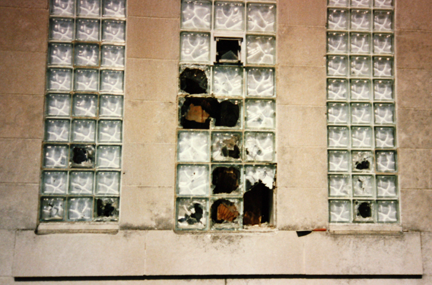 The vandalism occurred from 1988 thru 1994. 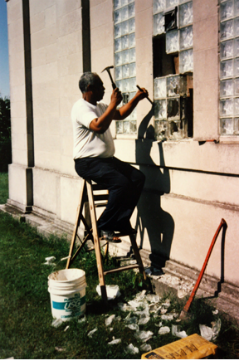 Did you notice the different types of glass blocks?